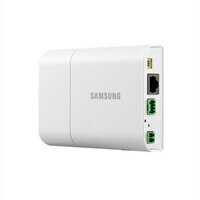 Samsung WiseNet III SNB-6011B Network surveillance cameraWisenet III, is not only performance driven but a cost effective solution. The unique DSP chipset technology within the Wisenet III line is developed by Hanwha and has unrivaled features found nowhere else in the security industry. The SNB-6011B is perfect for covert locations as well as installations where space is limited. The camera head is separated from the main unit allowing installation in unique locations such as bank tellers, ATMs, also provide flexibility with a 2 way Audio. The microSDXC memory card slot is located in the main unit away from the camera head further preventing theft of the recording medium. A 2.4mm pinhole lens provides a 134° horizontal viewing angle. High end functions include 120dB WDR, 30 fps FullHD 1080p, and intelligent video analytics. Wisenet III, is not only performance driven but a cost effective solution. The unique DSP chipset technology within the Wisenet III line is developed by Hanwha and has unrivaled features found nowhere else in the security industry. The SNB-6011B is perfect for covert locations as well as installations where space is limited. The camera head is separated from the main unit allowing installation in unique locations such as bank tellers, ATMs, also provide flexibility with a 2 way Audio. The microSDXC memory card slot is located in the main unit away from the camera head further preventing theft of the recording medium. A 2.4mm pinhole lens provides a 134° horizontal viewing angle. High end functions include 120dB WDR, 30 fps FullHD 1080p, and intelligent video analytics.